Successfully Added Laser Pointer + Wireless Receiver (Page Control Edition) to your Shopping Cart. Laser Pointer + Wireless Receiver (Page Control Edition). Using a bright (red) colored laser that has exceptional clarity, this pointer device is an excellent tool for professional presentations, highlighting information or simply pinpointing areas of interest to others. This is high quality laser pointer is ideal for delivering the perfect presentation, stimulating lectures, professional seminars, detailed facility inspections and guided tours. Highly effective when used with project screens, charts or slides, the CVEZ-PVRC is powerful enough to emit an extremely accurate laser beam that is visible on virtually all hard surfaces. Using infrared wireless technology, the laser pointer also has full Page Scroll functionality allowing you to scroll up and down documents, spreadsheets and internet sites. The professional pointer pen is compatible with many document types for maximum convenience, and is capable of sending an infrared signal to the USB Wireless Receiver up to 15 meters away ensuring you can deliver flawless presentations in even large halls. Designed with maximum portability and convenience in mind, the pointer comes in a compact form factor that resembles a professional pen enabling it to be carried conveniently anywhere, anytime in your pocket. Enclosed within a sturdy, blue all-metal casing, the pointer both looks and feels professional and would suit any venue from a lecture theater to an executive boardroom. 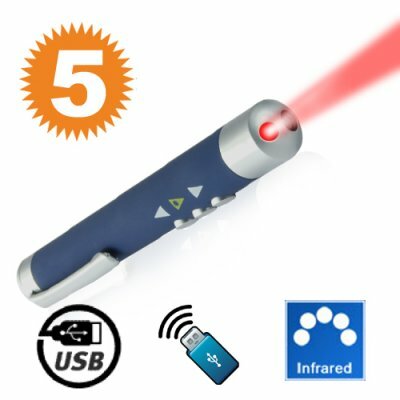 So order a few of these great laser pointers, use one for yourself and sell the rest on eBay or your local market to cover the cost of your one and the shipping. The CVEZ-PVRC Laser Pointer + Wireless Receiver (Page Control Edition) is proudly brought to you by the leader in China Wholesale Electronics, Chinavasion. Simple Plug and Play functionality - no software drivers required. It works great. The batteries already have been installed - hope they will work still a few hours. Price / Performance ratio: 5 Stars!!! on 2010-02-17 04:59:28 Great Product! I received my lasers early this morning. I Just set up a powerpoint presentation and the laser works great...you don't even have to point at the receiver! Just point at the roof, the wall behind you almost anywhere and it still works. very sturdy feel.Keep it up Chinavasion.